The Sounders Tuesday used targeted allocation money to sign 27-year-old Norwegian midfielder Magnus Wolff Eikrem to the first-team roster. Seattle used targeted allocation money (TAM) to acquire Eikrem, making him the fourth player added to the first team using that process. Also known by his middle name Wolff, Eikrem began his pro career in 2011 with Molde FK of the Norwegian first division, where he had 68 appearances and six goals in three seasons. He transferred to SC Heerenveen of the Dutch Eredivisie for one season before playing two seasons for Cardiff City, where he made six English Premier League appearances in 2014-2015. Eikrem moved to Malmö in 2015, where he scored a career-high seven goals in 28 league appearances in his first season before capturing a pair of Allsvenskan titles in 2016 and 2017. He also started four of five appearances in Malmö’s runner-up run in the 2015-2016 Swedish Cup. The midfielder has 17 caps for Norway’s national team, including six appearances in 2014 FIFA World Cup qualifying. 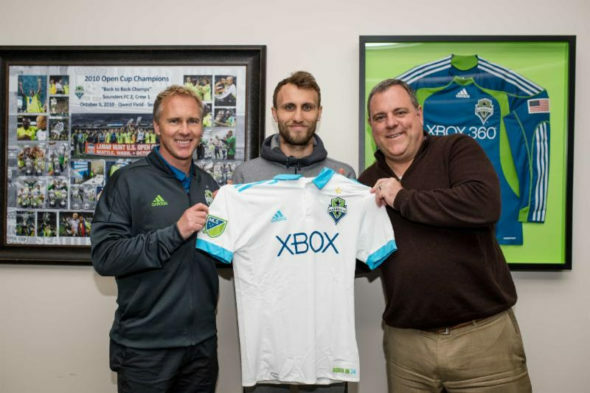 Eikrem joins Román Torres, Kelvin Leerdam and Víctor Rodríguez as a TAM signing. The Sounders leave Seattle Wednesday for a week-long preseason training stint in Tucson The club has games scheduled against the Portland Timbers Saturday and Columbus Crew SC Sunday. This is great! This is exactly what President Trump asked for when he said we needed more immigrants from Norway. Make America/Sounders Great Again!